Providing world class hockey development programs! Read about our curriculum, objectives & model... the DHD difference! 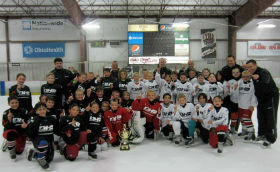 Donskov Hockey Development has been recognized throughout the world as a leader in hockey training and instruction. Our staff members have decades of experience both nationally and internationally as players, teachers, instructors and coaches. Don't miss your opportunity to take your game to the next level with our ™Total Skills Development Model. Outstanding qualifications, a strong work ethic, passion for the game and a genuine concern for teaching and promoting the game of hockey to our athletes, are all characteristics of our team members. At Donskov Hockey Development, our primary responsibility is to ensure that we provide our athletes an environment conducive to learning, skills development and FUN. Please enjoy our site…we look forward to seeing you on the ice! View DHD Informational Video 2019 Registration Open!